Michael Peca was born March 26, 1974 in Toronto, Canada. Throughout his career, he was known for his leadership, toughness, and tenacity, along with an unending willingness to use his body. Mike began playing junior hockey with the Sudbury Wolves of the Ontario Hockey League after they selected him in the 1st round of the 1990 player draft. After two years in Sudbury, Mike was traded to Ottawa where he put up 113 points in 55 games during his third season with the 67’s. In the 1992 NHL entry draft, Mike was selected 40th overall by the Vancouver Canucks. In 1994 Peca played a significant role for Canada’s Gold Medal winning World Junior team, and he returned to the NHL, playing in 38 games for Vancouver at the end of the 1994 -95 season. Canucks team officials were determined to fill a glaring weakness on defense and they also had their eye on Buffalo’s Alexander Mogilny. At the start of the 1995-96 season, the trade was consummated and Michael Peca became a Buffalo Sabre. It did not take long for the Sabres to find out how great a player the center from Toronto was going to be. Peca brought a hardworking, never give up attitude; a team leader who excelled at defensive play and had a knack for scoring shorthanded goals. It is a testament to his outstanding overall play as a defensive forward in that Peca won the Frank J. Selke trophy in 1997, when he tallied 20 goals and added 29 assists. He would go on to win that award again in 2002 while playing for the New York Islanders. In 1998, Peca was selected captain, acquiring the nickname, “Captain Crunch”, for delivering bone crunching open ice hits. He served in that role during Buffalo’s run to the Stanley Cup finals in 1999. Peca retired in 2009, as a member of the Columbus Blue Jackets. He also played for the Oilers and Maple Leafs. During his five years in Buffalo, he netted 96 goals while offering 121 assists. The Sabres made the playoffs his final four years and he scored eight times during those appearances. 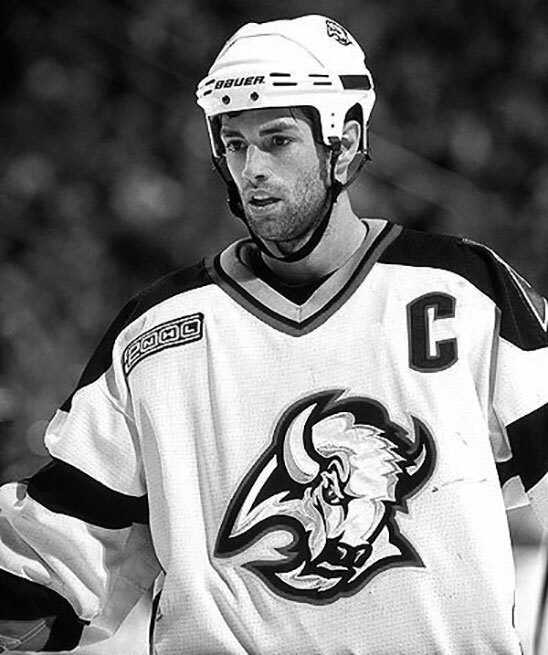 Although his time in Buffalo was limited, Michael Peca was an outstanding leader, excelling along the way at every level of hockey. Today he resides in Buffalo with his wife Kristen and their two children. He continues to be a part of the Buffalo hockey community as former GM, Coach and Director of Hockey Operations for the Buffalo Junior Sabres.